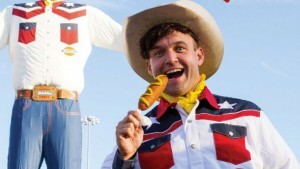 Chet Garner, the star of this TV show, criss-crosses Texas finding and trying out fun things to do in each town or city. He’s been to Abilene a few times. The show gives insider info about places to visit, food to try and people to see. Full disclosure: I’ve not actually watched the show, I’ve just heard about it several times and read the website/blog. It’s a great idea and he’s a friendly-seeming guy. Here’s a good link to a list of episodes, separated geographically by city. Get some ideas for day trips of your own!